Beneficiaries: 184 persons, 128 (70%) of whom are low and moderate income. 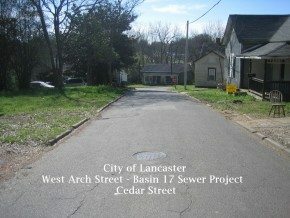 Project Description: The project will consist of approximately 9,955 linear feet of cured in place pipe (CIPP) lining, 39 main sewer line upgrades, 375 linear feet of 8-inch gravity sewer line replacement, the upgrade of 44 manholes, cutting hammer taps or roots and cleaning/inspecting 76 laterals to upgrade the sanitary sewer system in a portion of Service Area 18 in the Erwin Farms sewer collection system. This will address a U.S. Environmental protection Agency (EPA) Consent Order. Beneficiaries: 261 persons, 237 (91%) of whom are low and moderate income. Project Description: The project will consist of approximately 7,756 linear feet of cured in place pipe (CIPP) lining, 35 main sewer line upgrades, 625 linear feet of 6-inch and 8-inch gravity sewer line replacements, the upgrade of 41 manholes, cutting hammer taps or roots and cleaning/inspecting 130 laterals to upgrade the sanitary sewer system in Service Area 17 of the West Arch Street sewer collection system. This will address a U.S. Environmental protection Agency (EPA) Consent Order.